Waterbury Regulator Wall Clock, "Stork" model, 30 day movement; original dial and a seconds hand. 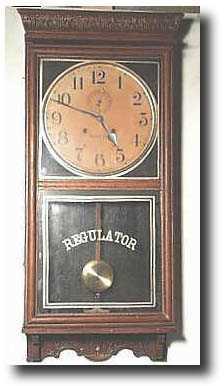 Case measures 37 by 17 inches, with original glass found in the bottom panel. It even has an original top and bottom. (Although the side piece on the top may be a replacement - not sure about this one.) Two good labels on the back verify its authenticity. One has directions and the other tells the name of the clock -"STORK".